The Jeep Grand Cherokee SRT: Will it be renamed the Grand Cherokee Trackhawk in 2016? DETROIT -- When Chrysler Group said in May that the SRT designation would be for Dodge vehicles only, it was silent on the fate of the SRT versions of the Chrysler 300 and Jeep Grand Cherokee. Now, clues are surfacing about the automaker's plans for the vehicles. First, dealers can order the Jeep Grand Cherokee SRT for the 2015 model year, so the vehicle will continue for now. But in July, Chrysler Group filed for a trademark on the name Trackhawk. A company source, who declined to be identified, said that the Grand Cherokee SRT is likely to be renamed the Grand Cherokee Trackhawk in 2016. However, the source said no final decision has been made. 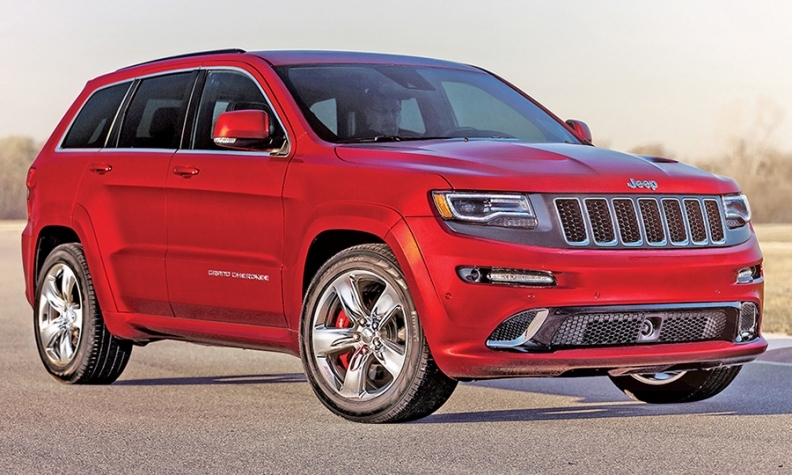 At $65,390, including shipping, the Grand Cherokee SRT is Jeep's highest-priced base model. The vehicle is powered by a 475-hp, 6.4-liter Hemi V-8. The Red Vapor edition of the 2015 Grand Cherokee SRT sells for $69,385, including shipping. A Jeep spokesman declined to comment on whether the brand intends to use the Trackhawk name. Jeep celebrates its 75th anniversary in 2016 and is planning special editions to mark the anniversary. Jeep uses a similar name, Trailhawk, on some versions of the Cherokee and Renegade that are outfitted for off-road use. The Renegade is a small SUV due in U.S. showrooms in early 2015. In the 2013 model year, Jeep produced a Trailhawk version of the Grand Cherokee but discontinued it for 2014, a spokeswoman for the brand said. Meanwhile, the other SRT vehicle outside Dodge, the Chrysler 300 SRT, will remain on sale in select right-hand-drive countries overseas in 2015, but not in North America. Spy photographers recently shot a camouflaged right-hand-drive 2015 Chrysler 300 SRT undergoing testing in Michigan. The Chrysler 300 is being refreshed for 2015, according to the brand's five-year business plan.